The department possesses a well-equipped Language Laboratory. For the fulfillment of its teaching and research goals, the department has competent faculty members who keep pace with the current developments in their fields of specialization. The language laboratory caters to the needs of students to learn, understand and improve language skills. 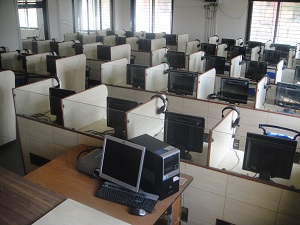 The Language Lab runs with 41 PCs and required software from reputed digital language lab software provided. The lab is occupied 100% of the time. On Saturdays and Holidays, it is available for other users. The Department has the unique role in complementing and enhancing the scientific spirit and technical knowledge with the humane and social values.